It is in the conversations between Beane and Brand that Moneyball lays the groundwork for its secret agneda. People will be naturally drawn to a sports movie where Brad Pitt smirks on the poster. Like Paul Giamatti in this year’s Win Win, it draws in an audience with expectations about sports movies and its star, then largely dismantles them. Sure, Pitt smirks and schemes like he often does, but screenwriters Steven Zaillian and Aaron Sorkin take more cues from The Social Network (which Sorkin wrote) than Ocean’s 11. 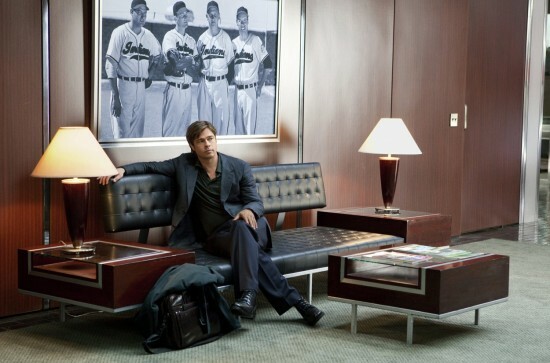 Moneyball is about the method behind baseball, not baseball. Underneath the drive to win big is a much sadder portrait of the outsourcing of a human game to the whims of computers. Although it is not as pessimistic as The Social Network, it still shows outcasts turning the tables on “the system” and then becoming it. Billy Beane is much more confident and charismatic than Mark Zuckerberg as well as divorced husband with a daughter he loves. Brand, however, is the one that shows him the mathematical way. His quiet demeanor, the way he sits in a room of older recruiters and the coach (Philip Seymour Hoffman in a reserved backseat role) with field experience and waits his turn to use his stats to dismantle, is fairly unsettling. People who saw last year’s Cyrus could see layers of depth in Jonah Hill that had yet to be explored in his many Judd Apatow-produced comedy roles. He does the most daring thing with this role: he makes Brand a completely boring, uninteresting person. By being forced to look at him side-by-side with Pitt’s grandiose movie star turn as Beane, you actually get a larger-than-life sense of what their relationship may have been like. 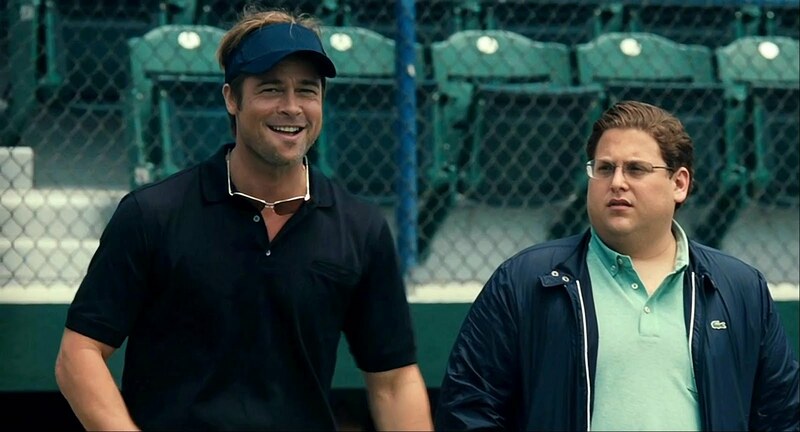 Director Bennett Miller approaches Moneyball with a mixed vision and with mixed results. He wants to emphasize Pitt, as most would, but he also wants to create a moody, visually sleek film. David Fincher he is not, but there are some terrifically lit baseball montages. For the most part though, he lets this be a Sorkin talkie, which is wise but much less thrilling than the end-result in The Social Network. All that talking leaves little room for baseball. The camera often looms through the little-seen corridors within the stadium. It’s filmed like a dark labyrinth of a Secret Society that we’re being granted temporary access to. This may be the most advantageous thing about Moneyball outside of its sly vision; another reason why it is good, but not one of the reasons it will be nominated for awards. Catch up on other great Brad Pitt films at LOVEFiLM such as Quentin Tarantino’s WWII revision film, Inglourious Basterds and this year’s critical sensation, Tree of Life. With of 70,000 titles and counting you’re sure to find something to watch! This entry was posted in Reviews and tagged Aaron Sorkin, Bennett Miller, Brad Pitt, Jonah Hill, Moneyball, Sports movies, The Social Network by matterspamer. Bookmark the permalink. Thanks! I definitely agree, because I can’t stand to watch baseball but I could handle people talking about it for more than two hours.